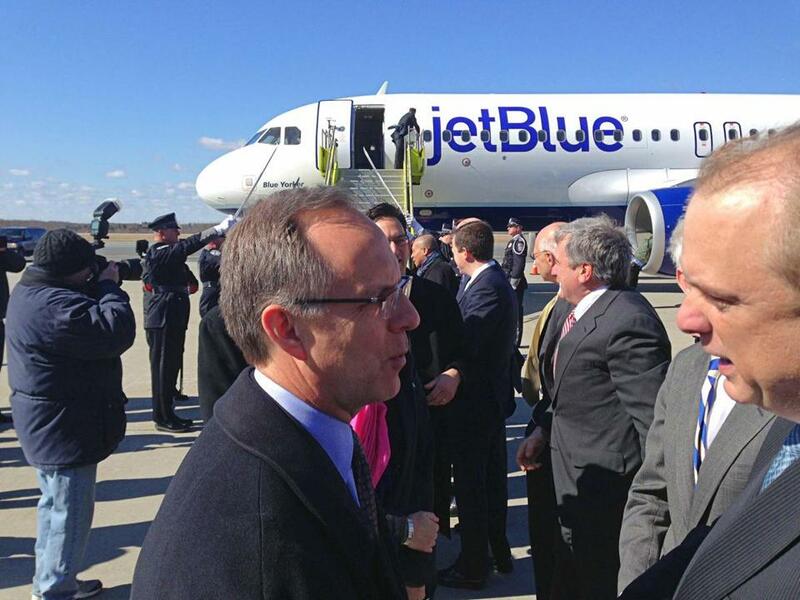 Dave J. Barger President & CEO of JetBlue Airways greeted Worcester Mayor Joseph M. Petty at the airport. The state subsidies used to attract JetBlue Airways Corp. to Worcester Regional Airport ran out at the end of 2015, but the chief executive of the Massachusetts Port Authority said he expects JetBlue to remain at the airport for the long haul. Thomas Glynn said Thursday that JetBlue’s passenger numbers at the airport were stable last year: The daily flights to and from Orlando and Fort Lauderdale, Fla., were roughly 85 percent full, on average, in 2015. Those percentages are similar to JetBlue’s levels in 2014, its first full year at the airport. Massport had offered nearly $500,000 in incentives over two years to help persuade JetBlue, already the largest carrier at the Massport-run Logan International Airport, to expand to Worcester. Those subsidies expired at the end of last year. Glynn said he had once been concerned that traffic would trail off during the warmer months, when presumably fewer New Englanders would want to travel to Florida. Massport spokesman Matthew Brelis said the agency saw 119,000 JetBlue passengers use the airport in 2015, and 2,300 traveled on charter flights. Those numbers represented a modest increase from 2014, when roughly 116,000 people traveled on JetBlue at Worcester and 2,090 used charter flights there. Massport acquired the struggling Worcester airport from the city in 2010 and spends millions to run it every year. The airport came with its challenges specific to its location — on a hill on the city’s western edge, on the other side of Worcester’s downtown from Interstate 290. For example, JetBlue had to cancel a number of flights due to heavy fog around the airport’s hilltop site within months of the launch. Massport is in the process of installing a new landing system that should make it much easier to land in poor visibility. Bringing commercial passenger service back to Worcester was one of Glynn’s top priorities after he became the agency’s CEO in September 2012. Earlier that year, Direct Air filed for bankruptcy, leaving the airport without a commercial carrier. Massport officials had been courting JetBlue for Worcester before Glynn’s arrival, in part because of Logan’s importance to JetBlue. The loss of Direct Air created more pressure to get a deal done. Those talks came to fruition nearly three years ago when JetBlue unveiled plans to start flying 100-seat jets each day between Worcester and both Orlando International Airport and Fort Lauderdale-Hollywood International Airport. Those flights began in November 2013.